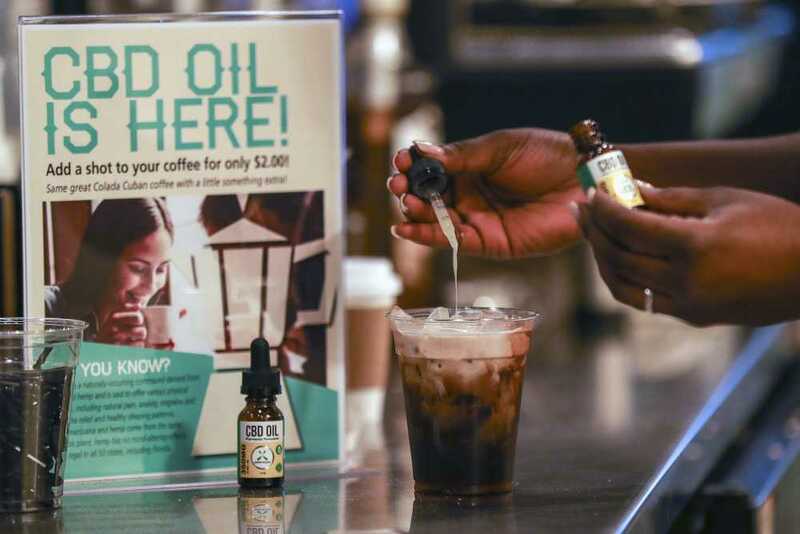 A worker adds cannabidiol (CBD) to a drink at a coffee shop in Fort Lauderdale, Florida. Mainstream retailers are leaping into the world of products such as skin creams and oils touting such benefits as reducing anxiety and helping with sleep. NEW YORK -- Mainstream retailers are leaping into the world of products like skin creams and oils touting such benefits as reducing anxiety and helping you sleep. The key ingredient? CBD, or cannabidiol, a compound derived from hemp and marijuana without the high. Retail sales of CBD consumer products in 2018 were estimated to reach as much as $2 billion, according to Cowen & Co. By 2025, the figure could hit $16 billion in retail sales, the investment firm predicts. Even high-end retailers are getting in on the action, charging anywhere from $12 to $150 an ounce. Barneys New York has opened a shop in Beverly Hills, California, selling CBD-infused creams along with hand-blown glass bongs and other accessories, while Neiman Marcus is now offering an array of CBD-infused beauty products from balms, lotions, soaps and masks in five of its stores. Meanwhile, online behemoth Amazon is staying clear of the stuff. Spokeswoman Cecilia Fan said the company prohibits the sale of products containing CBD and will remove them from its site if it sees them. Only drugs reviewed by the U.S. Food and Drug Administration as safe and effective can make claims they treat or prevent diseases or medical conditions. Many CBD producers try to get around that by using vague language about general health and well-being. Amy Nichols, a former food scientist from Indianapolis, reflects that distrust. Nichols, 46, who's been battling symptoms from autoimmune illness, has been using CBD oils by a brand called Recept she sticks under her tongue. CBD is operating within a patchwork of regulations varying by cities and states. In New York City, regulators are prohibiting outlets to sell CBD-infused food and beverages, threatening them with fines. Other states such as Ohio and California are taking similar action. Maine's governor, on the other hand, signed an emergency bill in late March allowing CBD in food products after state inspectors warned stores to pull them from shelves earlier in the year. The farm bill, passed late last year, gave states and the U.S. Department of Agriculture authority to regulate industrial hemp, a type of cannabis high in CBD. That opened the door to hemp-derived CBD products. But the farm bill gave the FDA authority over the food supply and the agency recently warned it's illegal to add CBD or THC -- the compound giving marijuana its high -- to human or animal food and beverages and transport it over state lines. Dietary supplements using CBD are also illegal. Bigger players such as CVS and Walgreens are sticking with skin creams and lotions where the FDA hasn't specifically expressed concern. Others are "rolling the dice" and selling CBD-infused drinks and supplements anyway in hopes of a profit, said Whitt Steineker, a Birmingham, Alabama, attorney who advises the hemp industry.